Ladies and gents, the much anticipated Nokia Windows Phone devices seem to have leaked out in their final version hours before Nokia World 2011 kicks off. 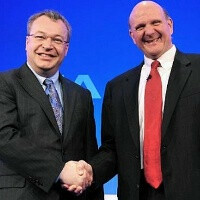 Welcome, Nokia's "bunch of phones:" the Nokia Lumia 800, the Nokia Lumia 710 and the Nokia 900, but keep that shade of doubt about the veracity of their specs and the actual names until the official announcement confirms those. 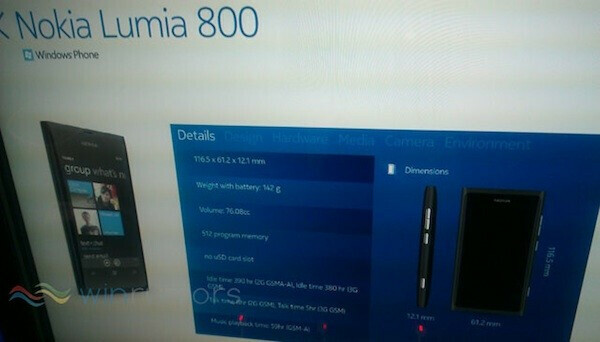 In the meantime, though, we'd mention that they definitely look credible – the Nokia Lumia 800, previously appearing under the Sea Ray codename, has now been confirmed to look almost exactly like the MeeGo-based Nokia N9. The biggest difference will be in the smaller screen – the N9 has a 3.9” display, while the Lumia 800 is expected to feature a 3.7” AMOLED screen. 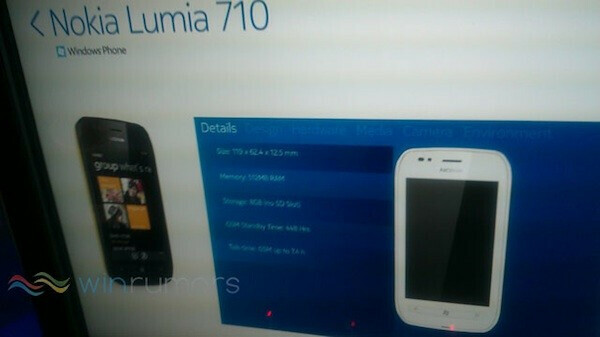 The Nokia Lumia 710, previously referred to as the Nokia Sabre, seems like the more affordable option. It stands out with its distinct diamond shaped body. The spec sheet also lists 512MB of RAM and 8GB of internal storage. Rumors place both device release dates in November for Europe, but we're still looking forward to a US release schedule. Finally, the Nokia 900, previously appearing as the Nokia Ace, is the high-end model, with a huge 4.3" ClearBlack AMOLED display, 1.4GHz processor and 1 gig of RAM. The Nokia 900 has a boxy design, but what caught our eye is the 8-megapixel Carl Zeiss lens. Could it rival the Nokia N8? Certainly not in the pixel count, but it's still curious to see whether Nokia has managed to use its camera insight on the Windows Phone platform. After shifting to SE some years ago, never looked back to Nokia again, UNTIL NOW. Although I'm happy with android, I'm also attracted to WP7.5. So I'm happy with the "marriage" of WP7.5 and Nokia. 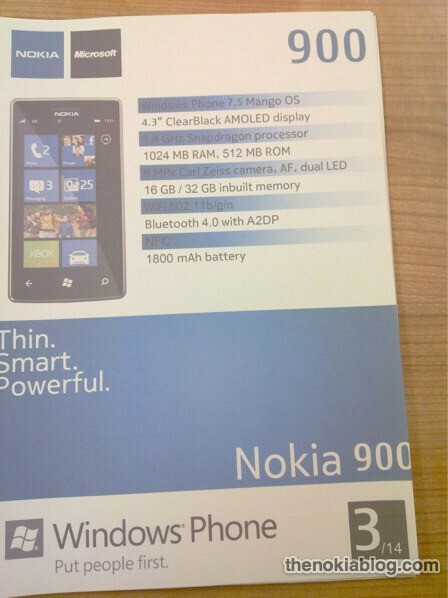 This is it, Nokia with WP7.5 is my next phone! LOL! Does the 900 have a ffc? I would hardly consider a 1.4ghz single-core a "high-end", now that there are 1.5GHz dual-cores. what do you consider as a high end? Sensation XE, rezound with old and weak snapdragon which is slower than lower clocked OMAP? Are you one of those sheeps who look only at spec sheet without thinking about real life day-to-day usage? Dual cores...what do you need it for? 1080p is still more marketing trick than quality and if you don't know how to use phone properly (the same computer) and you open 50 apps that's your problem. This specification is absolutely lovely and enough for daily usage, even rough.